If you find yourself often suffering from wrist fatigue during holiday dinners or when making big meals for a lot of people, you might want to consider buying an electric fillet knife. This knife does all of the hard work for you, and you only have to guide it where you want it to get glorious cuts of just about anything! Our electric fillet knife buying guide will help you after we tell you some things to look out for! 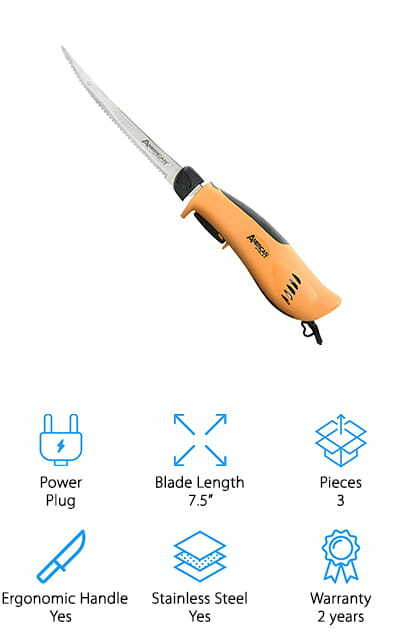 Power: Is it a cordless knife that you can charge and then use as you need it, or one that you have to plug in in order to get any power? This is important for how you’re using it. Blade Length: The length of the blade can also determine what it’s going to be best for. Smaller tasks might require smaller blades to be effective, whereas a turkey is going to need something longer to cut through it. Pieces: What comes in the knife set? Some are going to come with additional blades and even organizing blocks to keep all of your accessories in one location where you can get to and find everything you need. Ergonomic Handle: The ergonomic handle both reduces wrist strain and makes sure that you’re getting the best cuts, especially on long cutting jobs. You want your knife to be great to handle while you’re getting the job done. Stainless Steel Blade: Stainless steel isn’t porous, doesn’t soak up any juices, and the best part is that it doesn’t rust at all. Stainless steel blades are by far the best and most sanitary choice for knives in general. Warranty: If there is a manufacturing defect with your electric knife, you’re going to want it replaced or your money refunded. That’s what a warranty is for – you’re covered within the warranty time frame from normal problems. Now that you know all that you need to about these products, we can get to the electric fish fillet knife reviews. Fish is a great use for these knives, though any type of meat or even bread will do! Check out our top pick and budget pick if you’re in a hurry, before returning to look at the rest of our list as well. They’re the best of the best with no questions asked! 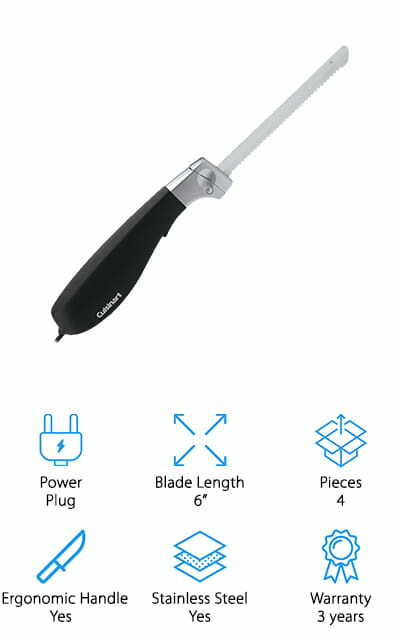 The best electric knife for sale is this piece from Cuisinart. Of course, Cuisinart makes a great kitchen product, including this knife! It comes with the base, two different blades (one for meat and one for bread), and a block to organize it all on. The block includes a place to wrap the 4-foot electrical cord that powers the fillet knife. The power in this motor will make any carving task easier, from cutting pieces off of a Christmas ham to carving a huge Thanksgiving turkey. Get the power you need with these stainless steel blades that are sharp right out of the package to slice and dice through anything you need it for! Plus, it has a safety lock system to keep this powerful tool out of the hands of your kids. Your kitchen can finally be complete with this electric knife set. It cuts through homemade bread with the same ease it can fillet fish with! The best cheap electric knife is from Black + Decker, who is popular for their power tools. 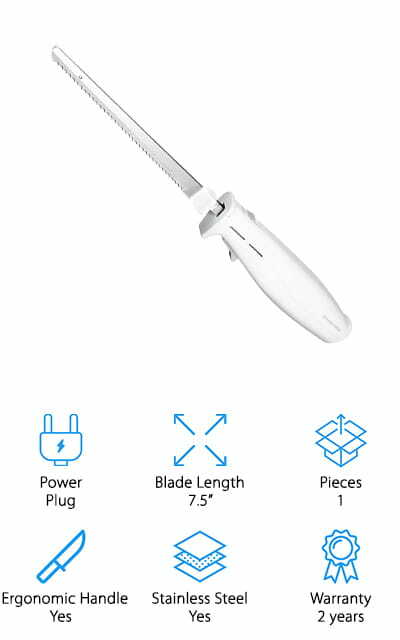 Why not bring a little of that knowledge into the kitchen for this powerful electric knife? You can slice into meat, bread, cheeses, and even non-food items with this sturdy blade. You can even use it for craft projects that require slicing into foam or other heavy materials. This knife makes all of quick and easy, and you’re going to wonder how you ever survived without one! The handle is ergonomic to make your grip easier for long projects, such as carving a whole turkey. You can even wash the blades by laying them flat in the dishwasher – invaluable when you’re busy with so much other stuff. The 9-inch blades snap right into the base with little to no effort and you won’t have to do much to get it running. 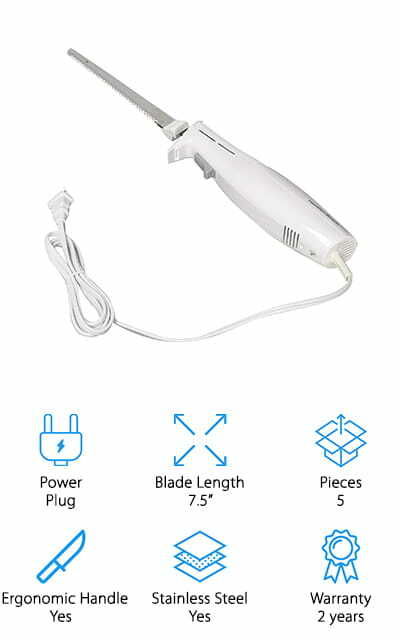 We love the power in this electric knife! What is the best electric fillet knife? You’re going to have to decide that for yourself, but we think that this set from Hamilton Beach could very well be it. It includes the electric knife with detachable blade, a carving fork to help hold your meats in place while you’re slicing them, and a carrying case to help keep it all together. That’s a pretty amazing carving set, and at such an affordable price! 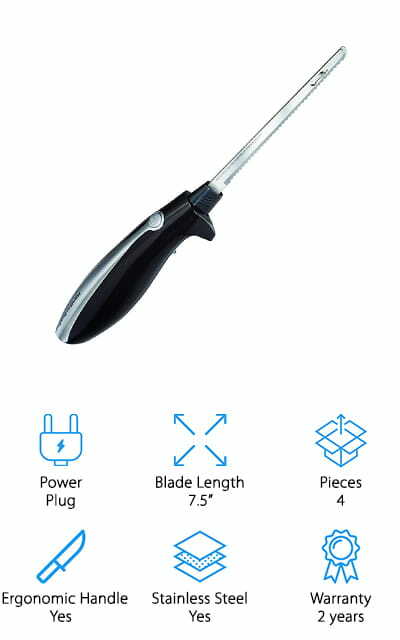 The electric knife itself is lovely, nice and powerful with an ergonomic handle that is meant to keep your jobs comfortable no matter what you’re carving. You can use this on bread, meats, cheeses – and even to cut deli-like slices of your favorite products. Why pay more when you can get it done at home? The trigger lets you control the power so you don’t have to worry about any motion that feels unnatural to shut it off or turn it on! Our list just wouldn’t be complete without this Rapala electric fillet knife review! This cordless knife packs a serious punch and can get through a ton of meats, cheese, and fish without breaking a sweat. 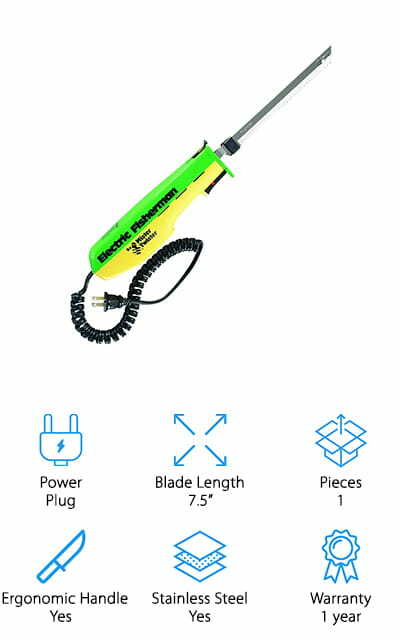 It takes about two hours to get a full charge on the Lithium-ion battery, but once it’s charged it will run for a continuous 80 minutes of cutting and filleting. How amazing is that? The design of the handle keeps it quiet and increases airflow, so the motor doesn’t get hot and your hand won’t get hot while using it. This also creates a more relaxed grip on the body so that your hands and wrists aren’t cramping up if you happen to be filleting a lot of fish. The blade is 7-inches long and super sharp for the toughest filleting jobs! We love the consistent speed and power in this cordless electric fillet knife! It definitely won’t let you down when you need it! This blade by Mister Twister is quite possibly the best electric fillet knife for crappie – at least that we could find. This is because the blade is thin and has a tapered point, allowing you to get more precision way easier with your cut. The handle is also nice and attractive, with two bright colors so you’re able to find it in your gear. The blade release will allow you to take the blade completely out for cleaning or storage, and for disabling the knife around children. The handle is relaxed and ergonomic so that you can fillet your entire catch in one go. You can use an extension cord to get a little more space with the knife, but otherwise, it’s a great product that works exactly as it’s intended to. 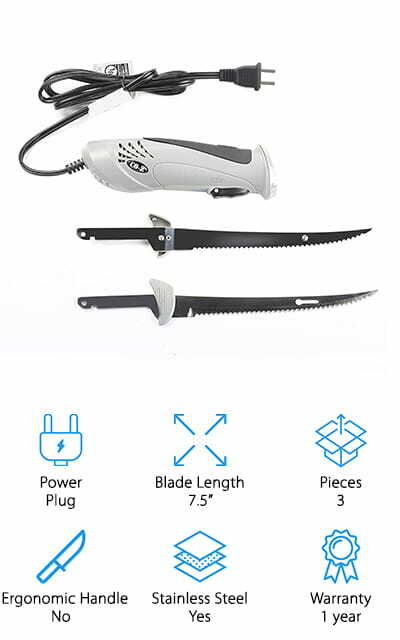 The Electric Fisherman is probably the best electric fish fillet knife that we could find, and we love it. We know you will too! This electric fillet knife from Proctor Silex is great for someone who isn’t sure if they want to use an electric knife. It’s a great beginner kit and we can definitely respect that. Simply enough, it features a 7.5-inch serrated blade that you can pop out for storage or disable the knife. It has an ergonomic grip so you can even tackle larger projects with ease, and the controls are at your fingertips, activated by the touch of a button. It’s also a lot lighter than some of the other knives we’ve seen because it’s a much simpler design. You only have to guide the knife through the meat, and you don’t even have to make the sawing motion that you normally would in order to get perfect, professional cuts every time with this great knife. It’s affordable and it’s going to last you a long time. The stainless steel blades hold an edge and won’t rust! This 12-volt electric fillet knife is a step up from the last Hamilton Beach knife set on our list. 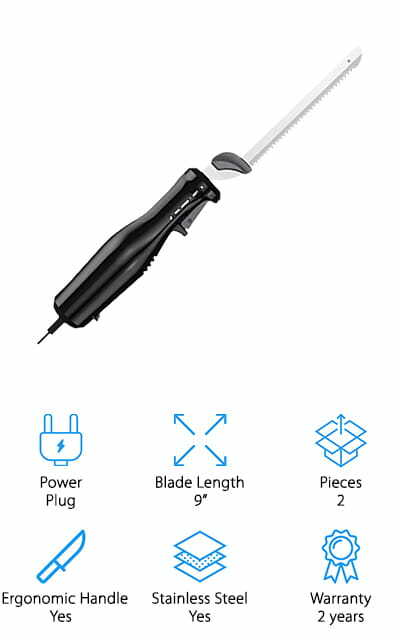 This time, the handle is more intuitive and there are more speed options to make sure that you’re getting whatever you need out of this electric knife. It comes with a super convenient compact carrying case so you can keep all of the separate parts together. You’ll always have them when you need them! This includes a carving fork to help get a better grip on whatever you’re trying to cut into. The stainless steel blade detaches for easy clean-up – the blade and the fork can be put into the dishwasher to wash. It’s that simple! Now you won’t have to expend any effort to get the cuts of meat that you want – and to impress your guests with your masterful knife-handling skills. The serrated edge even cuts bread to perfection without squashing it! This knife is a beast! This corded knife by Rapala is great for filleting fish – as Rapala is a fishing company, this is exactly what it’s intended for. The motor in this particular model is a super heavy duty, and can slice things out faster and without expending any effort at all! We love how much this model can get done. The blades are reciprocating, but even so, they can be taken off of the knife and thrown into the dishwasher and still function. Not only does it have a reported twice the speed of other filleting knives, but it also allegedly has three times the power to get through those tough slicing jobs. The power cord is eight feet long and gives you just enough room to work in a tight space. It’s the right size for a lot of different cuts and types of fish and fillets, so it’s incredibly versatile and great for busy people. This electric fillet knife from American Angler is perfect for filleting a wide range of fish – even ones that are big or have a lot of large bones. This Pro Series knife packs twice the torque of any of the other pieces in their line, and that’s pretty impressive. This thing was made to get the job done without breaking a sweat or making a fuss. The blade is stainless steel so it won’t rust and it will keep its edge for a lot longer than some other knives on the market right now. It has a super long lifespan, so you can keep doing what you’re doing for years to come. Not to mention you can buy replacement blades easily through the manufacturer. There’s even increased airflow in the handle to keep your hand cool! That’s a pretty amazing feature. No matter the size of the fish or its bones, you’ve got it easy! The first thing that comes to mind about this knife is that it’s solid, incredibly so. It’s got a super-powered motor that can slice through just about anything you throw at it and features two 7.5” blades that reciprocate back to bring you the best, cleanest cut you can imagine. These blades can be detached and put on the top rack of the dishwasher for a perfect clean. The power cord is five feet long so you’ll have plenty of room to maneuver around your countertops or filleting tables. 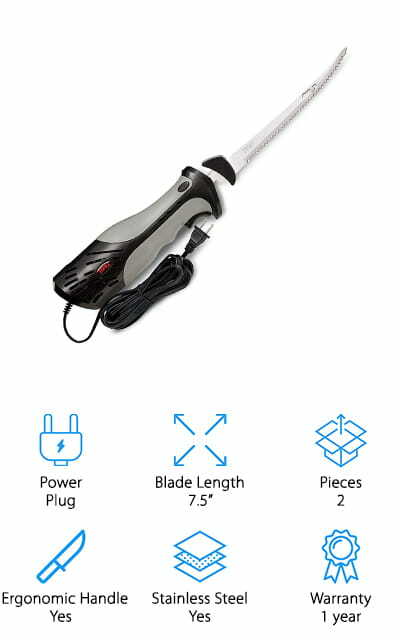 It’s got a lot of power, up to twice the power of a regular knife and twice the speed as well, so you can have those fish done in no time at all! The handle is big and easy to grip, so your fingers won’t cramp up after prolonged use and you can get your whole catch done in one sitting. That’s valuable time well spent!